Then. Another group regrets following the signs. What did they think was going to happen? They wanted to survive, and now they sit listening to the screams. Gareth is in this group. This must be the Terminus group in the beginning, before they were crazy cannibals. Now. Our little group is vastly different. They don’t sit crying, but rather preparing to bring some pain. Everyone makes make-shift weapons. Daryl warns that they’re coming, and the group prepares to go for their eyes. Instead of coming from the front, the door opens above, and a gas grenade is dropped. There’s no running from it, but Rick gets someone, before he’s knocked out. The men wake, bound and gagged, brought in front of some sort of feeding trough. In the distance a body is being cut up. Down the line heads are hit with a steal bat, and throats are slit. The blood drained into the sink. Gareth comes in asking about shell counts right before Glenn falls victim. Bob tells him that they have someone with a cure, but Gareth tells him that they cannot go back. He asks Rick what was in the bag he left in the woods, threatening Bob. Rick tells him what’s in the bag including the machete with the red handle that he’s going to kill him with. Gareth tells his men that they have two hours to finish with the bodies. Just before Glenn gets his brains racked, something shakes the building. Carol, Tyrese and Judith walk the tracks headed towards Terminus. Carol plans to drop them off and leave them. A walker stumbles onto the track. Tyrese can’t kill it, not yet. Carol walks over and stabs it easy enough, but there is a huge group of them coming. The trio hide, and the walkers approach. The sound of gunfire draw them away and down the tracks. The gunfire was likely from Terminus, either they were being attacked, or they were attacking. Carol plots out an alternate track to get to Terminus. A guy sets up fireworks. He knew Michonne was trouble just looking at her, as he chats on the walkie. Carol gets him at gunpoint. He claims that Michonne and Carl are the only ones that they have. He needs to set up his charges, they all have to go off at the same time to confuse the walkers. Carol doesn’t want the walkers confused, she needs them. He tells her that Terminus is a compound, that they’ll spot her, but she plans to kill them anyways. Tyrese stays behind with Judith to watch their captive. Carol sets out, covering herself in zombie goo. He asks Tyrese about the baby. Tyrese doesn’t say much, only that Judith is a friend. The man remembers friends, but doesn’t have them anymore, and he’s use to it. Tyrese isn’t use to losing people. The guy tells him that Tyrese is a good guy, the type that saves babies. But babies are like anchors in the sea, they’re get you nowhere. He tells him that because of him being a good guy, he’s going to die. Or he can take the baby and the car and get out of there. He really doesn’t want to kill Tyrese. Carol approaches the compound. She sees Rick and the others being dragged away from the train car. Carol watches through her scope as they kill some walkers. She spots a gas tank, and the others spot the herd closing in. The Terminus folks make a run for it, and Carol blows up the gas tank. It takes out some of the walkers, but merely knocks down many of them. They stumble back up. Tyrese sees the smoke in the distance. His captive asks if that’s Terminus. It is. He tries to instill doubt in Tyrese, telling him that his friend probably just got capped. Or perhaps he will. Tyrese doesn’t think that he has to die, but thinking like that the captive tells Tyrese that he’ll likely be the one dying. All hell is breaking loose in Terminus. Gareth leaves Rick and the others while he goes to check on the others. He leaves the knifemen to watch the group. Bad move, Rick has a shank and he’s working on freeing himself. The people of Terminus are scrambling, and falling prey to the zombies who have a gateway into the compound thanks to Carol. Carol enters in the herd. The knifemen are concerned what is happening outside, since there’s no contact. Rick takes advantage of the chaos, causing a little bit of his own as he kills both of the men, and frees Daryl, Glenn and Bob. In the train car Abraham wants out, he wonders what is happening on the outside. Eugene thinks he has a way to get out. Maggie and Carl know that the men will be back, and they’ll all get out together. They all continue to work on getting out. Michonne watches the walkers, they’re atleast safe from them. Carol passes by people getting eaten, but as shots are fired at the walkers, Carol falls back, and shots the Terminus gunmen, giving up the safety of the herd. Rick tells the men to kill anyone they come across, because they won’t hesitate. The four head over to a train car to release its inhabitants. There’s only one lone crazyman, and he becomes walker food instantly. Glenn bashes the man and the zombie with his bat, and Daryl pulls him back before he’s spotted. Carol looks around the room she’s stumbled into. It’s full of lots of items taken from the people eaten. She pockets a watch before moving to the guns, and onto her actual mission. They foursome need to make a move, but there are gunners coming. Rick plots to take them out. He crouches waiting, and nearly gets munched. Daryl saves him just in time. The gunners come through clearing out the walkers, and Rick grabs the last one, killing him. He shoots all the others. There’s no way to get to the train car from where they’re at, they have to double back. Carol continues her search, finds the room with all the candles when she’s caught by the BBQ lady. She tells her to drop her weapons, she wants to see her face, knowing she destroyed her sanctuary, and compromised her meat supply. Carol isn’t going down so easily though, and the pair scuffle. Carol gets the upperhand, and holds her by gunpoint. She tells her that the signs were real. It was a sanctuary, until a group came through and raped and slaughtered them. They fought back, and took back their home. You’re either the butcher, or the cow. Carol asks the people they took from the train car. The woman doesn’t tell her about them, only that she could have been one of them. Carol shoots her in the leg, and the woman tells her to aim for her head. But Carol isn’t going to give her that satisfaction. She opens the door, and lets the walkers in to do the dirty work. Tyrese continues to watch the distance for any signs of Carol. Walkers are starting to surround the little cabin. His captive uses the distraction to grab Judith. He doesn’t want to hurt her, but he tells Tyrese that he will. He wants Tyrese to drop his weapons and head out in the walkers. Tyrese hesitates, but heads outside. He makes a call of the walkie, but there’s no response. The walker noise stops completely. Tyrese comes barreling in and beats the man with his bare hands. Outside he killed all of the walkers. The traincar inhabitants sit around waiting for rescue. Sasha asks what the cure is, but Eugene is tightlipped, its classified. He tells them that even if he gives them step by step instructions the cure will die with him. They may not understand it, but they still want to hear it. He was part of a human genome project, fight diseases with diseases. He believes he can flip the script of the failsafe, and put things to right. The group is down for the idea. Maggie wants to get back to work, but no need. Rick and the cavalry has arrived, and it’s a mad dash to the fence with plenty of walker head bashing along the way. It’s utterly gory, and as they make it to the fence, the terminus folks arrive, but Rick’s last bullets are enough to discourage their pursuit. Rick and Daryl scope out their gun stash. 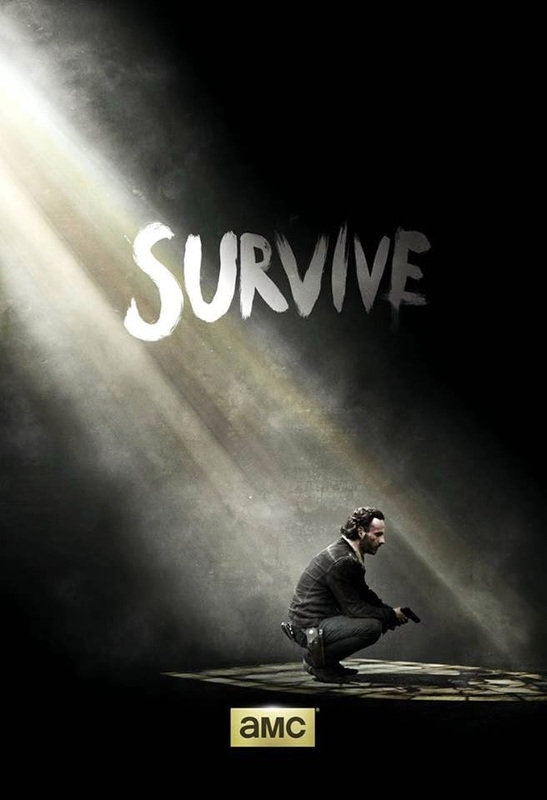 Rick wants to go back and kill the last of the survivors. The ones stuck in the train car want to just leave them to the fate of the walkers. They didn’t see the killing trough, or see that people were on the menu. Carol finds the group, and its Daryl who rushes in to embrace her. Rick asks if she was the one who caused the explosion, before pulling him in for an embrace. She brings the group back to the little shack, and the happiest moment of reunion is upon them. Rick and Carl have Judith back, and Tyrese is reunited with Sasha. Carol asks what happened, and Tyrese tells her that the walkers came, and he took care of them, and their prisoner. Rick and the others prepare to hit the road again. They have to get away. Abraham needs to talk, but not just yet. Onto the train tracks they go, headed as far away from Terminus as they can get. Rick makes some correction to the Terminus sign, making it read No Sanctuary. Then. The people of Terminus are in the same train car as Rick and his people were. One is chosen, begging, not again. Gareth plans to take back Terminus from their aggressors. They will no longer be the cow. Was that man in the darkness Negan? He’s coming eventually we know that. Someone follows the tracks. He sees Rick’s sign of No Sanctuary, sees the markings on the trees, knows where to head. It’s Morgan, and he’s following the group.